I purchased this iron mug tree a couple of months ago at a local thrift shop. 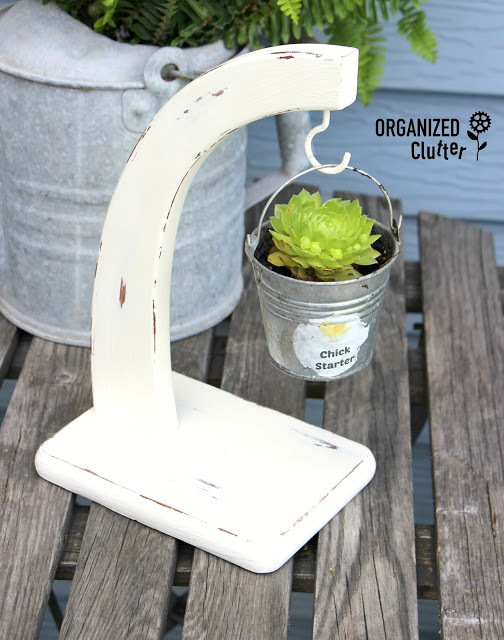 Read on to see the mug tree re-purposed for the garden! 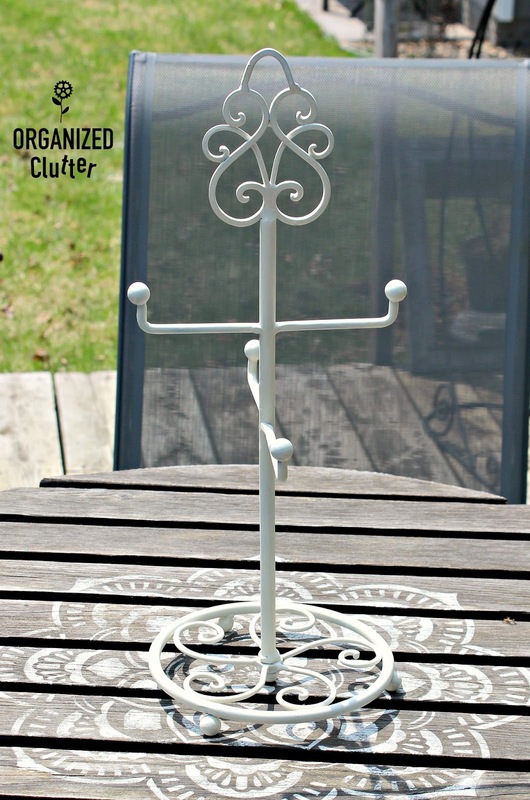 First, I sprayed the mug tree with two coats of Chalked Spray Paint in Chiffon Cream/Off White . Here is the mug tree sprayed painted in chiffon cream. I found these little galvanized buckets at Hobby Lobby. They are on sale now for $2.39 each. The rooster, pig, cow and windmill are vinyl stickers. I sprayed them a couple of times with Krylon Clear Coatings Aerosol in Satin Finish to help keep the vinyl decals from coming off. 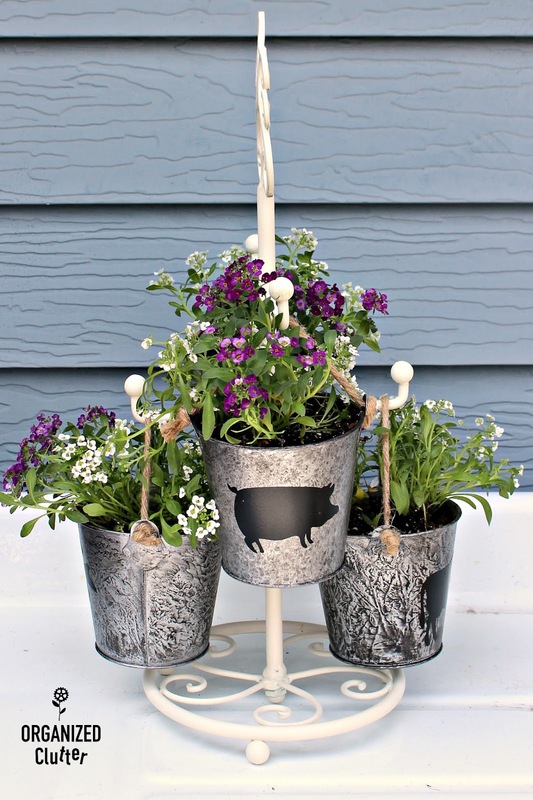 I am going to plant my little buckets with sweet alyssum in two colors. My little buckets will get watered everyday, and I live in Minnesota, but if you live where it is hot and dry, you could easily fill your little buckets with succulents. I used a nail and a hammer to make two drainage holes in the bottom of each bucket. I used Miracle-Gro Moisture Control Potting Mix as my soil. 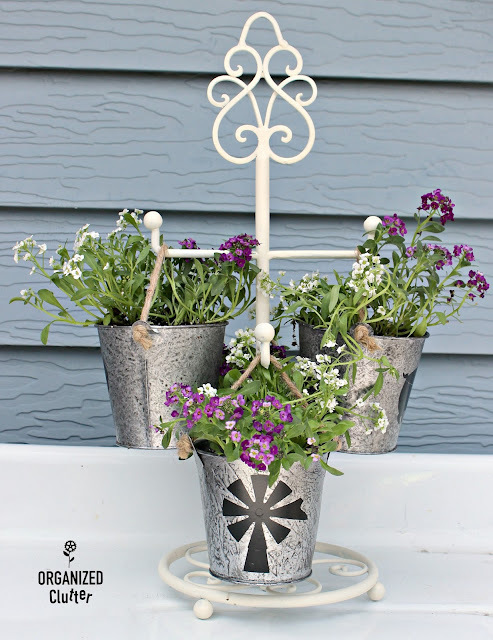 Here are my newly planted sweet alyssums in Hobby Lobby galvanized buckets, and hanging on my thrifted mug tree. I planted each bucket with one purple and one white alyssum. Two buckets have the white one in front and two buckets have the purple one in front. I can't wait until the pots fill in! What a great idea. I will be on the lookout for one of these to put out on my porch. What a fun upcycle! 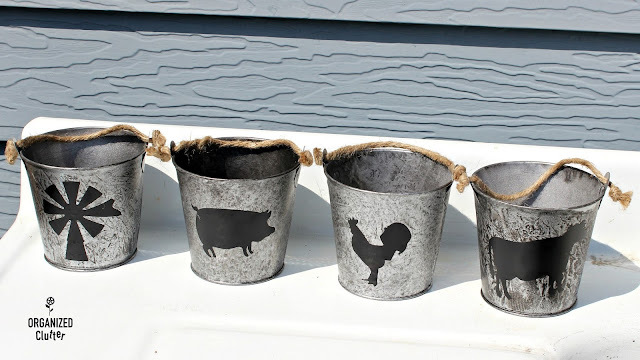 Love the little buckets with the farm animals and windmill. 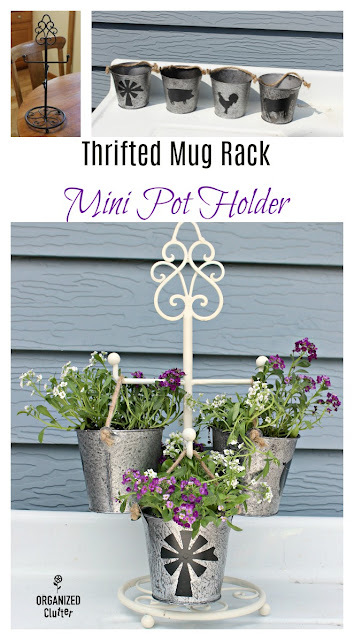 They look so cute hanging on the cup holder with flowers.